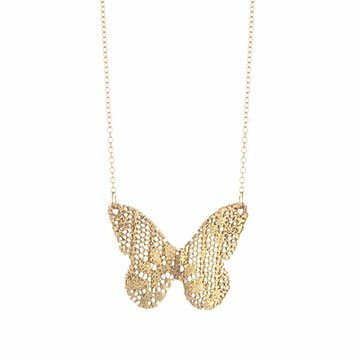 This dipped-lace butterfly necklace is handmade by artisans in Colombia. A symbol of transformation and hope, the butterfly is an endless source of inspiration. This extra-special iteration begins with ornate pieces of lace, which are cut and sewn by Colombian artisans, then dipped in wax, copper, and 24-karat gold. Wear it as a reminder that there's always room to spread your wings, or make it a gift for anyone you’d like to share a bit of beauty with. Handmade in Colombia. I wear this usually for special occasions. It is a larger than I thought. This silk dipped butterfly is a perfect gift for my mom. She views butterflies as a sign of her late father and this just topped the cake for her! A wonderful gift. My mom has worn it everyday since she has got it!